Poppable treats are high up on my favorite foods list. They are the kind that I may walk by, grab a few, and keep going. It happens so fast sometimes, that it is as if the food never left the plate. A great way of rationalizing, don’t you think? I, also, love nuts. Most kinds make me happy, but almonds seem to be the ones that I love popping the most. Raw almonds just don’t do it for me. Toasted to a gorgeous deep brown color, almonds are delicious to nosh on. Sometimes, though, I want my toasted almonds to have sweetness to them. I know, what a surprise that I want something sweeter! My Covered Almonds cover all the bases of what I want. The nuts are first toasted to perfection. Then they are cooked on the stove with sugar, cinnamon, vanilla and water. After being refrigerated the almonds are drenched in chocolate and then the final pièce de résistance; the almonds are rolled around in a confectioners sugar/cinnamon combination. A real bonus of this recipe is that you can tailor it to your own individual craving. If you don’t want chocolate, the recipe may be left as is after the nuts are cooked on the stove. Don’t care for confectioners sugar/cinnamon? Leave it out and just enjoy the chocolate covered nuts. Personally, I eat a few of the nuts after they have been cooked and cooled initially. Then I eat some more when they are still gooey with just the chocolate. Finally, I roll most of the chocolate covered nuts in confections sugar/cinnamon, but I call for only enough of this mixture to totally cover most of the almonds. The few other almonds that are not rolled, will still get dusted with the mixture and then formed into clusters. How is that for taking full advantage of one recipe? As I was making the Covered Almonds today, Shoshana came into the kitchen and started popping them into her mouth. For a while there, she was popping at the rate I was covering, taking from both the chocolate covered nut pan and the final product pan. Toast the almonds in a 350° oven until deeply browned, about 10 minutes, occasionally stirring the nuts with a large spoon. Combine the sugar, 1½ teaspoons cinnamon, vanilla and water into a medium saucepan. Add the toasted almonds. Cook over medium high heat, stirring constantly, until the sugar crystallizes, the liquid evaporates and the almonds are completely coated, about 8-12 minutes. The mixture will be harder to stir at this point. Immediately pour the almonds onto a parchment lined baking sheet and refrigerate for 20 minutes. Melt the chocolate in a large metal bowl that has been placed over a saucepan of simmering water. Hold onto the bowl with a potholder as it gets hot. Separate almonds by breaking them apart with your hands. Once the chocolate is melted add the cooled almonds. Stir until all of the almonds are coated with chocolate. Pour onto the second parchment lined baking sheet. Refrigerate for 5 minutes. Shake off all the crumbs from the first parchment paper and place back onto a baking sheet. Combine the confectioners sugar with the remaining 1 tablespoon cinnamon. Roll the chocolate covered almonds in the sugar mixture and place onto the parchment lined baking sheet until completely dry. Transfer to a sealed container. Bittersweet, semisweet or milk chocolate may be used. Personal preference will dictate which you go with. I buy the thin white disposable gloves at the grocery store and wear them to roll the nuts in the confectioners sugar. The nuts separate beautifully and best of all…no mess, no fuss! 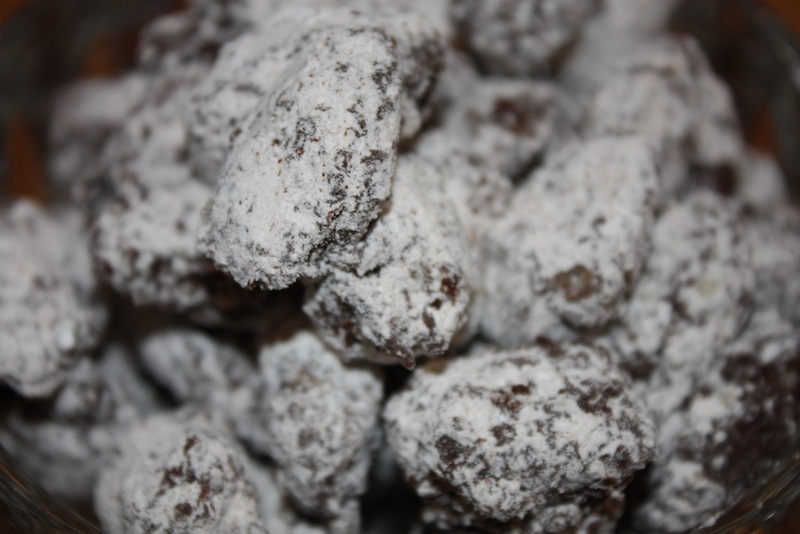 The amount of confectioners sugar mixed with cinnamon called for is with the purpose of covering most of the chocolate covered almonds completely and then dusting the remaining nuts with some of the mixture and forming nut clusters. If you prefer to have all the nuts covered with confectioners sugar/cinnamon, add an additional ½ cup confectioners sugar plus 1 teaspoon cinnamon to the recipe. This looks a little complicated. They look so-o-o-o-o good but difficult and awkward for a clumsy cook like me. Am I correct?